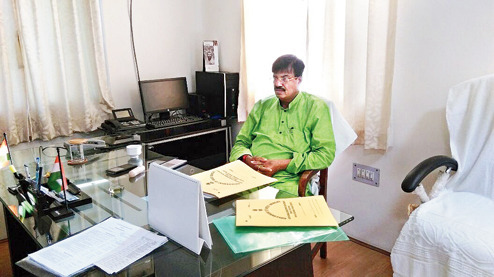 Rabindranath Ghosh, the new minister in charge of north Bengal development department, today said he was planning to open offices in all seven districts for better execution of schemes. Speaking to The Telegraph over the phone from Calcutta, Ghosh said: "I have plans to open a branch of the department in all districts of north Bengal for better execution of schemes. The offices can help handle different works at district level and make it convenient for people to access the department." The department has offices in Jalpaiguri and Kurseong now. It is headquartered at Vivekananda Bhavan off Hill Cart Road in Siliguri. The minister said he would attend his office in Siliguri thrice a week. Ghosh said his focus would be on the improvement of infrastructure and tourism destinations in the region. "The chief minister has bestowed a huge responsibility on me. I have already spoken to officials of my department and will give impetus to infrastructure development and creation of new tourism destinations in the region." Elected from Natabari Assembly constituency in Cooch Behar for the second time, Ghosh was given the most important ministry in north Bengal in terms of scale of work and allocation of funds. As the Trinamul Cooch Behar district president, he was rewarded by Mamata for ensuring the party's victory in eight of the nine seats in the district in the Assembly elections. In 2011, Trinamul could secure only four seats in the district. "After I was assigned with north Bengal development department, I have spoken to my cabinet colleague Gautam Deb, who had held the portfolio in the past five years and executed hundreds of projects in the region. He is the tourism minister now. I have sought his guidance and will work in consonance with his department in the coming days," said Ghosh. In the past five years, the state has made a total budgetary allocation of around Rs 1,800 crore for the department. Ghosh said he would sit with officials and collect feedback from all the seven districts to make an assessment on the condition of roads and drainage. "Based on the findings, we will take up projects in areas concerned. I also have plans to expand the green cover of north Bengal by taking up extensive plantation programmes in association with the forest department," said Ghosh. After taking oath as the minister, Ghosh is yet to visit his home or the office in Siliguri.